rose somewhat, migrant deaths at sea skyrocketed. enter the EU across the waters, while the figure grew to 218,000 in 2014. The Italian coastguard approaches a ship with more than 400 Syrian refugees. joint search-and-rescue patrols, establishing resettlement quotas. Some EU members such as France, Spain, and Britain rejected the idea of quotas for sharing migrants among them, while others suggested deploying military forces to Libya to keep migrants as far away from Europe as possible. Libya and Tunisia, to lock up and pre-empt asylum seekers before they cross the Mediterranean. to prevent departures.” Italy’s foreign minister even called for air strikes in Libya against ISIL positions there. coming from the very countries that they expect to beg for asylum. parties such as Christian Democratic Union (CDU) and Social Democratic Party (SPD). the EU’s envisioned use of military might against migrants trying to cross the Mediterranean. money to rescue the refugees running away from the war zones they create. to the neighboring countries, while many others have taken the difficult and deadly path to Europe. 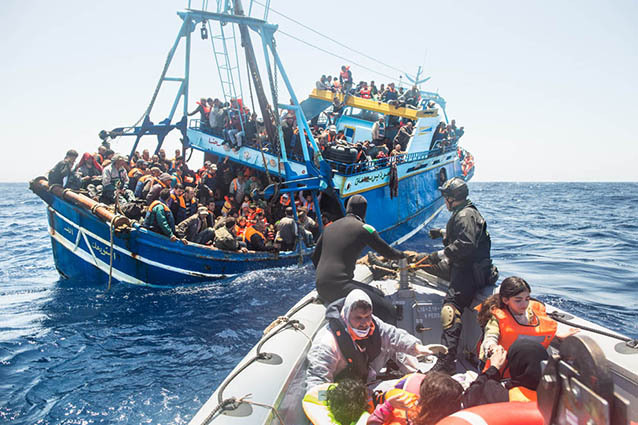 converting the Mediterranean into a graveyard, hoping that this will serve as deterrent to others. citizen, born in Zanzibar and currently in Ottawa. He can be reached at nizar1941@gmail.com.